The maiden and the dragon met on the night of the new moon, when the darkness would be deepest and the virtuous would be inside and afraid. They met on a high moor, lonely enough to be suitable for the conference, and the wind howled and cried and pulled at the maiden’s long cornsilk hair as if it were the soul of a badly neglected child. The dragon twisted herself into a form to match that of the maiden’s, out of courtesy, for ancient things are always well-mannered. She was tall and slender and she bent like a tree when the maiden came near. When she parted her lips to speak, the inside of her throat glowed like coals. Her red eyes smoked gently. She was very beautiful when it suited her to be so, and very terrible always, and when she wished to be at her most terrible beauty was the means she chose. But the maiden wasn’t afraid. The maiden dropped into a crouch and produced a silver knife from her skirts, slashed a line down the inside of her arm. Blood welled; in the starlight it was like flowers blooming in the snow. The dragon licked her lips. The maiden dipped two fingers into her own blood and drew a circle on the ground to contain herself. At the place of each of the four corners of the world she placed a rune, the name of which cannot be spoken aloud unless the speaker is willing to spill a great deal more blood than can be drawn from a cut on the arm. The maiden was born beautiful, grew up beautiful, and only became more beautiful as she reached the age of womanhood. When her mother and father died she lived alone, since she cared for no one’s company. But when she walked among the villagers she heard them say that someone should finish the job she had started, find a tower and lock her in it. She cut her cornsilk hair short with a silver knife by the light of a waning gibbous moon and burned it in a patch of bare, dead earth, salting the ashes when she was done. She perceived the webwork of a story weaving itself around her, closing around her throat like a silken noose. You must understand that this was before she knew that stories were their own kind of magic. And like all forms of magic, they are subject to manipulation. High in her tower, the maiden sat at a window and watched the procession as it made its way through the town and up toward the rocky foothills — up toward the dragon’s cave. She sat behind thick curtains and peered through the gap between them. It wouldn’t do for a hostage to be seen moving about free. The procession of knights was glorious to see. They were all tall men, strong, some handsome and some not but all supposedly loyal and gallant and chivalrous and all the things that knights were supposed to be. Their armor and lances shone. The glossy hides of their horses shone as well. They were a line of gleaming jewels in motion, marching bravely to death. Some of them, she knew. Some of them had fought to win her, and then fought the maiden herself. She was weary of them, all of them, and she knew that she must be weary of them to grant the final victory of the final knight additional weight and significance. Or so it would supposedly be. So she had known for so long, again and again. But the maiden now understood that knowing was not stone. And she wasn’t weary of fighting. She licked her lips and thought of the dragon’s forked tongue. In the long silence that followed, the maiden lowered her still-bleeding arm and smudged a break in the circle. At some point the dragon stepped through the break and took the maiden’s arm in her claws and licked the blood off her skin. The maiden smiled and touched her mouth to the cool armor of the dragon’s throat. The wind turned away and screamed. “They’re already telling,” said the maiden, turning her head in the dragon’s lap. The dragon was carding her long emerald claws through the maiden’s hair and it was dangerously close to putting them both to sleep, but the maiden was thinking. There was more to do. The picture wasn’t yet complete. “In the village. Beyond. It draws more of them in.” The maiden closed her eyes and thought of them, that parade of jewels coming from all four corners, invisibly runed and bound in her blood circle. Her blood — their blood. They had so much more than her and now it wasn’t exactly as though they needed it anymore. And really, wasn’t she only giving them what they wanted? “They are like cattle,” said the dragon. She sat in a corner of her cave on a pile of bloodstained rugs, nursing a small wound on her thigh. The maiden looked up from where she was bending over a tangle of knightly viscera, separating the various organs into piles of the useful and the discarded. The dragon reached down and picked up a severed head, regarding it with faint melancholy. Its eyes were half closed and its tongue protruded. Its beard was matted with gore. The maiden wondered if it might be advisable to put it on a stake at the base of the hill. “I am making myself a monster,” said the dragon. When she moved her wings the shifted air played with the obsidian and jasper tangles of her hair. The maiden watched this play of spun gemstone, rose to her feet and went to the dragon. Her fingers left bloody streaks down gleaming scales. Her mouth left the dragon’s lips swollen and hungry. She had vats of the blood of chivalry, tapestries of gut, towers of bone. She had no real plans for any of them, but they all made excellent props. “Tonight,” said the maiden. She knelt between the dragon’s knees and the dragon cradled her glowing head in her claws. Understanding passed between them like breath. The dragon was bare-breasted, and when she let her wings hang free this way the maiden was almost sure that she could see the dragon’s heart beating inside her scaled chest like a little pulsing sun. “Neither of us will die?” asked the dragon. Behind her red eyes there was something a bit like fear. The maiden shook her head. The last knight came riding up the path of bone, through the forest of femurs and empty armor. It was sunset and the light caught the point of his lance and made it look as though it were already bloody. He was the largest, the strongest, the most courageous, of course here to ride to victory where everyone else had failed, and as she watched him approach the maiden knew that he was the one she had been waiting for. The dragon burst out to meet him with all her beauty stripped away, all massive beating wings and tongues of flame, and there was barely the span of a breath before the knight drove his gleaming lance into the dragon’s beating sun of a heart, piercing its armor and spilling its steaming blood into the dust where the blood of so many gallant knights had been spilled in its turn. The dragon fell dead, still twitching, and the maiden came running from the cave, at last free, crying with joy and throwing herself into the knight’s strong arms. And there was living, happily and ever after. And her joy turned to ashes in her mouth as the dragon burst out of the cave’s entrance, already in flight, beating the knight’s steed into the ground with its dark clouds of wings. The knight tried to raise his lance but it was already too late, and he died burning and bitten in half as the dragon threw back its head and roared its victory. The maiden turned away and wept. The last knight came riding up the path of bone, through the forest of femurs and empty armor. It was sundown and the light caught the point of his lance and made it look as though it were already bloody. He was the largest, the strongest, the most courageous, of course here to ride to victory where everyone else had failed, and as she watched him approach the maiden knew that he was the one she had been waiting for. The knight stopped on the patch of flat, gore-matted ground by the entrance to the dragon’s cave, raised his lance high and gave one great, deep cry of challenge. No words. No come out and face me, beast, or I have come to take back the treasure you have stolen — meaning the maiden, of course. The ones who said things like that, she had asked the dragon to kill especially slowly. But the dragon didn’t stir. And from her hiding place in a pile of boulders by the entrance, the maiden stepped out into the dusk and faced the knight. The knight said nothing for a moment. The maiden said nothing as well. They stared at each other in silence and the last of the sun touched the horizon and deepened the shadows to the obsidian and jasper of the dragon’s hair. No blood, whispered the wind. No blood. Except that the blood of the dragon was burned into her tongue and throat and it burned still. Still doubtful, the knight extended his hand, leaned down and reached for the maiden. The maiden took his hand at once and swung easily up into the saddle in front of him, but she swung up facing him instead of facing forward, and if he had not expected this, he certainly did not expect the silver knife that flashed through the dying light and cut into the exposed flesh of his throat. He twitched, jerked, fell forward and the maiden caught him. She was drenched in blood, in her cornsilk hair and her white gown. She opened her mouth into its flow and let it fill her. From the cave’s entrance she heard the roar and smelled the smoke as the dragon belched flames. There were flames in her as well, rising higher and consuming her from the inside out, and she understood that these were the flames in which some of her daughters would burn and she wept for them. But then she rose into the air, threw back her head and laughed through her tears. The wind howled around her and the moon turned red and bled across the sky. The world was twisting like torn fabric between angry fingers. There is a point at which every victim tires of being so. There is a point at which every victim perceives the joys of being the villain. The dragon rose into the air beside her, serpentine, lizard-formed. The maiden settled on her back and twisted the world, gut and flesh and bone, her hands slick with burning blood. The dragon licked the maiden clean of the blood of chivalry. The moon was rising, just past the full. The silver knife caught its light where it lay in the last of the blood, and that light was in turn caught and reddened by the dragon’s eyes. The maiden reflected on the difference between caught light and caused light, and wondered if the difference was a meaningful one. She shivered under the dragon’s forked tongue. “It is done?” rumbled the dragon. Her wings were demurely folded across her shoulders, but the maiden was sure she could still see that glowing heart. “And we’ll live forever,” mused the dragon. “Some of us,” said the maiden. Which might come to the same. She curled herself into the fold of the dragon’s wings and felt that fiery heart beat against her own. The vats of blood, the towers of bone — time or the eyes of people could take them. None of it mattered now. Power was immaterial. They could tell what they wanted to tell; they had this one story for themselves, a tiny spark that they could fan into a flame. She leaned up and curved her lips against the dragon’s cruel mouth, and smiled as they rose ever higher. Sunny Moraine is a humanoid creature of average height, luminosity, and inertial mass. 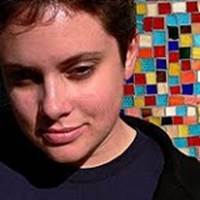 They’re also a doctoral candidate in sociology and a writer–like object whose work has appeared or is forthcoming in Lightspeed, Shimmer, Clarkesworld, and Long Hidden: Speculative Fiction from the Margins of History, as well as multiple Year’s Best anthologies, all of which has provided lovely reasons to avoid a dissertation. Their first novel Line and Orbit, co–written with Lisa Soem, is available from Samhain Publishing. Their solo–authored novel Crowflight is available from Masque Books. They can be found at sunnymoraine.com. What a beautiful, amazing story! Sunny is a brilliant writer.